Andie of Renaissance Dyeing offered to tell us a little bit about dyeing wool threads with woad, which is a plant that produces a blue dye. At Renaissance Dyeing, Andie uses natural plants and mordants available in the 16th century and earlier to achieve a gorgeous range of colors in her hand-dyed wool. 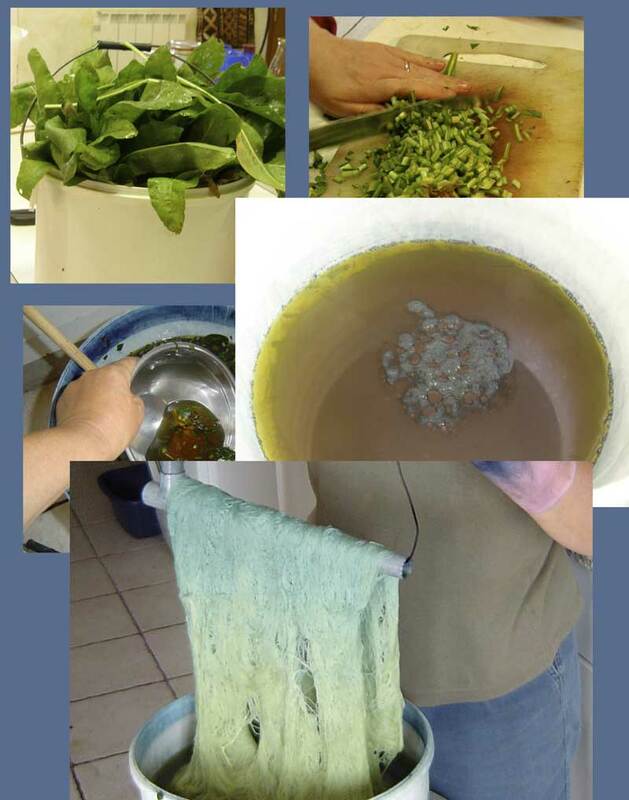 I hope you’ll find her commentary on dyeing with woad as interesting as I do! All the pictures in the article can be clicked for larger versions. What, might you think, does an unassuming plant like this have to do with your embroidery? If you look closely at the leaf tips you will get a clue. 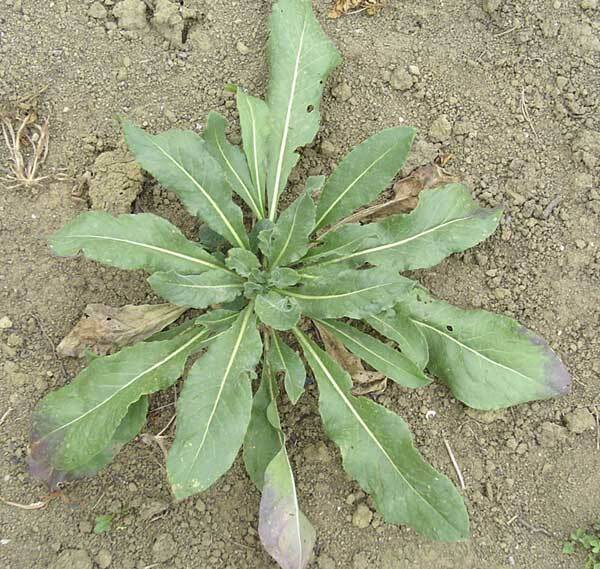 This is Isatis Tinctoria or Woad and it is ready to give up its hidden secrets. Just north of where I live in France, 600 hundred years ago this plant grew on thousands of acres of land in the triangle between Toulouse, Albi and Carcassonne. Endless processions of carts hauled the fermented woad balls to lucrative markets in Spain, Flanders and England and the revenue from the blue treasure built the splendid red city of Toulouse among others. A hundred years later war, adverse weather, greed and the far stronger pigment found in the Indigofera Tinctoria plant, also known as True Indigo, from the East saw the beginning of the demise of the woad industry in France and indeed Europe. The woad mills, once a hundred strong, dwindled to a handful . An intact woad drying barn with its wooden racks can still be seen at The Chateau de Magrin in the Tarn which, by the way, also boasts a view that hasn’t changed in 400 years. The Woad plant pictured above grows in my garden, sown in the spring the leaves can be harvested 3 or 4 times in a good year. The next spring it will shoot and the blue pigment in the leaves will disappear and by early summer a multitude of tiny yellow flowers appear followed by purple teardrop shaped seeds. The first year’s leaves are harvested by hand, washed, chopped finely and placed in a bucket, covered with boiling water and left to stand for about an hour while the pigment leaches out. The resulting liquid is strained, whisked, made alkali with washing soda and then the air is eliminated from the vat. This used to be and still can be done by fermenting with urine for a few weeks but a spoonful of Rit Run Remover is quicker and less smelly. Once ready the vat can be used until the pigment is exhausted. It will dye almost anything blue; all fibres, wood, bone, leather and especially hands. The indigo pigment found in woad will only adhere to fibres if it is in an alkaline air-less vat, the blue indigo pigment becomes what is known as white indigo under these conditions. You can see in the image above that the liquid in the vat is in fact yellow and not blue. It is this ‘white’ indigo that adheres to the fibres and when they are withdrawn from the vat and come in to contact with the air the magic happens and the fibres turn blue. This is how we dye our crewel embroidery wool. The wool is first wound into 100g hanks and washed. Usually 500g is dyed at one time. The hanks are lowered carefully into the woad vat so as not to introduce air. They are then turned gently for 15 minutes to make sure the dyeing is even and then carefully removed and aired for a further 15 minutes. Care has to be taken not to allow drips to drop into the vat as the introduction of air to the vat will turn the white indigo blue again and it will stop working. The wool is dipped and aired again to deepen the blue and improve light-fastness. All shades are dipped at least twice and most 3 or 4 times. Some of the darker woad shades have been dipped several times. As well as using woad for the woad dyed crewel pack, I use woad in the blues, green and purples in the Elizabethan range. Also because it is not so strong as indigo pigment, I use it as a ‘fine tool’ when putting fine layers of blue on the lighter purples and greens. I enjoy working with woad it seems to be easier to use than indigo, the vat rarely turning blue and inoperative, and often there is a slightly turquoise hue to it that I don’t see with true indigo. I love reading bits like this – the history of the textile industry is So Amazing! And it fascinates me that such a simple green plant can yield such rich blues! I used Renaissance Dyeing’s crewel wool (colors from the Elizabethan range) in various parts of my Crewel Rooster project, and I really enjoyed working with it. It’s a soft wool that stitches up beautifully. And for a couple lucky readers out there, you’ll get the opportunity to try some Renaissance Dyeing wool (the woad range), thanks to Andie! So keep an eye out for a give-away! Humans are amazing curious creatures. Fascinating. I can’t believe you can achieve so many shades of blue from this one plant. Love it. What a facinating plant! I would love to watch while the wool changes color to the beautiful shades of blue! Magic! I have a friend who recently bought the Elizabethan range plus several of the woads – just because they are so beautiful! A great addition to her stash! I really enjoyed this article. thank you. While I have never dyed with woad, I have done a little indigo dyeing and it is truly amazing to watch. When the stuff (whatever it is) comes out of the vat it is a bilious yellow-green colour and with contact with the air it gradually turns the most glorious blue. Also did you know that the Iceni tribe, of which Boadicea was Queen, used woad to paint up their bodies and faces before going into battle? I always thought they grew their own woad but perhaps not? Maybe they imported it from France. I had some growing in my herb garden some years ago but we moved away from there and I lost most of my beloved plants. Thanks Mary for posting another great article! What an interesting comparison to working with the indigo vat, a la Deerfield embroidery. The gradations of blue are certainly intriguing. You’ve also given us yet another reason to spend time touring in France! The textile heritage is so rich & the French are very proud to maintain their skills in some very tiny towns.